When Intel introduced its first line of dual core desktop processors we were all shocked at how cheap you could buy them. 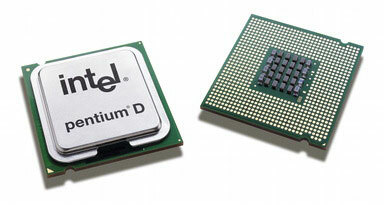 The Pentium D 820, running at 2.8GHz, was the first Intel processor we recommended since Intel's Northwood core. It was no surprise to anyone that Prescott was too hot and offered no real performance advantage to justify its downside when compared to AMD's Athlon 64 CPUs. With the Pentium D, Intel still had the heat problems and underwhelming performance, but for heavy multitaskers and users of multithreaded applications the performance could not be beat. The Pentium D 820 debuted at $241, putting it at about the same price as a single core Athlon 64 3500+. AMD eventually responded by introducing an Athlon 64 X2 3800+, priced at $354. While it was still more expensive than Intel's entry level dual core, it was a step in the right direction for AMD and the X2 3800+ quickly became a favorite among enthusiasts. The X2 3800+ managed to outperform, in many cases, Intel's most expensive dual core processors while running a lot cooler and being offered at a much better price point. Intel's ability to undercut AMD's pricing on dual core processors is not too difficult to understand. Until recently, AMD has only had a single plant producing 90nm processors on 200mm wafers, meaning that every dual core CPU they produce made a serious dent in the number of total CPUs they can produce. Even though AMD's new Fab 36 just started shipping revenue generating product, dual core chips will continue to come out of Fab 30 for the time being. Intel, by comparison, has a total of five 300mm fabs currently in production that crank out both 90nm and 65nm CPUs. Being able to produce chips on 300mm wafers itself means that you can make more chips at a time, but also having many more fabs helps as well. Intel estimates that its five 300mm fabs can produce as many chips as approximately eight of its older 200mm fabs. What this all boils down to is that pricing its entry-level dual core processor in the $200 - $250 range is not too difficult for Intel, but with the introduction of the Pentium D 900 series the deal was about to get even sweeter. With the Pentium D 900 series, Intel took its dual core processors and started making them on a 65nm process. Along with the die shrink Intel equipped their 65nm offerings with twice the L2 cache as their 90nm 800 series, thus making them even more desirable. The icing on the cake was that the Pentium D 900 series was not much more expensive than the 800 series it was replacing; the Pentium D 920 can be found today for as low as $244. With Intel intent on moving all of its processors over to 65nm, the older 90nm Pentium D line got a nice price cut. The once $240+ Pentium D 820 is now a $160 chip, making it around the price of a single core Athlon 64 3200+. Although the single core AMD CPU will still do better in gaming, the Pentium D 820 will definitely hold its own in any multithreaded environments or encoding tasks. To even further move the market to dual core, Intel quietly introduced yet another processor - the 90nm Pentium D 805. Clocked at 2.66GHz with a meager 533MHz FSB (compared to 800MHz of the other Pentium D CPUs), the Pentium D 805 can be had for as little as $132. Sit back and think about that for a moment; for $133 you are getting a dual core processor that can run in any LGA-775 Intel 945 based motherboard. It wasn't very long ago that a SMP system would cost you significantly more than a high end desktop setup, but thanks to the move to dual core CPUs and some very aggressive pricing on Intel's part, you can now have a dual core processor for about $20 more than a Celeron. Admittedly we've been a bit too high end focused lately here on AnandTech, as seemingly all that's been released these days is Extreme Edition this and FX that. But if you have to upgrade today, now is truly a great time to buy something low end as you await the next-generation of CPUs and platforms from AMD and Intel. At the moment the 805 is a good deal and has been heavily discounted. However, from the recent anandtech story about intel pricing, the price of 9xx chips is due to REDUCE quite a bit on 23 and/or 30 April. And further big reductions on say 950 are due when Conroe launches (even if it is in small volumes then). My point is that the RELATIVE BARGAIN of the 805 now will be rivalled by 9xx on a price/performance/cost/benefit basis. ie it has Hardware virtualisation, is COOLER for the given amount of work, and with the new 9xx steppings, will be further improved in April. Thus the 805 will still be good value but not as far ahead of 9xx as it is now. You are right that as a budget "stop-gap" until Conroe it is tempting, which makes it all the more useful if 975X "conroe-ready" boards could be made NOW with "conroe ready" stickers slapped on the boxes. Once the price drops, 930 should be more attractive than they are today. Also intels roadmap still shows 950 quite a while into the future so (again after the price drop) that could be good to go for. I can buy a 975XBX Intel board from a local reseller. Actually we are Intel resellers/processor integrators ourselves! But HOW CAN I TELL the difference between an early 975XBX that was NOT Conroe ready without component and wire mods, from the NEW 975XBX which is conroe ready already? Is it some board revision number marked on the board? Is it some "conroe ready" sticker on the box and/or board? If I can't find rival vendors offering 975X board for conroe I may have to buy the own brand intel one (although this was not anand's first choice when reviewed), but even then I need a CLEAR way to differentiate between a conroe-ready version of it and a not ready. Is there a link to Intel information about the differences? "From April" is pretty useless as there is a timelag between USA availability and stock reaching distribution channels in the UK so we can buy it off them. Also the problem of distributors holding stock and selling it after the changeover date. I need a way to tell the difference. As you're aware, "April" alone is meaningless. In fact, it's misleading.